In a small nonreactive heat-proof bowl, cover the sun-dried tomato halves with the boiling water and set aside until softened, about 20 minutes. Drain the tomatoes and chop them coarsely. Fill a large pot with water, cover and bring to a boil. Meanwhile, in a large nonreactive saucepan, heat the olive oil. Add the shallot and garlic and cook over moderate heat until softened but not browned, about 5 minutes. Add the sun-dried tomatoes and cook for 1 minute. Add the wine and boil over high heat until almost evaporated, 2 to 3 minutes. Add the chicken stock and bring to a boil. Gently stir in the crabmeat and oregano and cook until heated though, about 2 minutes. Remove from the pan from the heat and add the butter; stir until smooth. Season with salt and pepper. Add salt and the farfalle to the boiling water. Cover partially until the water just returns to a boil, then uncover, stir the pasta and cook until al dente. Drain the pasta and transfer it to a large warmed serving bowl. 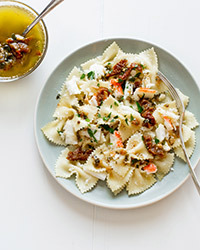 Pour the crab sauce over the farfalle, add the chopped parsley and toss well. Serve at once. The crisp and flowery flavors of the Ronco del Gnemiz Tocai Friulano highlight the delicate sweetness of the crab. Review Body: This is a nice dish that complements the delicate flavor of crab. Putting in the butter off the heat was a good idea. I used fresh basil instead of oregano and it worked well, and I did add some parmesan to enrich the sauce.